so just remember that if there's a discrepancy...he's wrong. The only issue I've encountered with DropMyRights is that Outlook Express will now open each hyperlink in a mail message in a new window, instead of reusing existing Internet Explorer windows. I've kept the original OE shortcut to open mail where I need it to open in the same window and show visited hyperlinks in a different color. If this is your saintly Mother's blog, you're probably safe to say 'Yes'. If this is a ...questionable...web site that you wouldn't want your Mother to see, say 'No'. I'd estimate that 80% of the time, this prompt is for a Flash advertisement that you'd be happy to miss, 10% of the time it's the portal of a web site and if you say 'No' you'll never see the web site, and 10% of the time it is the web sites' navigation system. You can always reload the page and say 'Yes'. Some sites won't work well or at all. 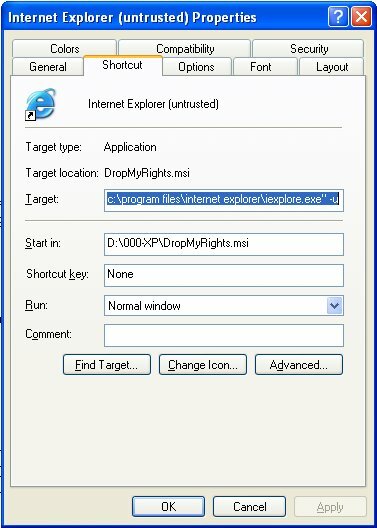 I've left my desktop Internet Explorer icon untouched, and if I must see a site, I'll use that. The Windows Update web site will prompt you six or more times; you have to say 'Yes' every time. If you click 'No' even once, you'll have to close the window and do it over again. If you get any other kind of prompt, in my never-humble opinion, you should seriously question visiting the web page that's prompting you. If a web page is trying to install a desktop item without your permission, they probably aren't nice people. Some sites, such as majorgeeks.com, want to download fonts to your computer when you visit the page. I would never do that. Any time a file is downloaded to your computer, whether you know them or not, you're taking a chance. Allow META REFRESH: Disable : This one is tricky. It isn't safe to let a web page redirect you to anywhere it wants, but many sites will use META REFRESH when they move a page. If I go to a page that is blank when it's finished loading, I look at the web page source code and copy-n-paste the URL into the address bar manually. 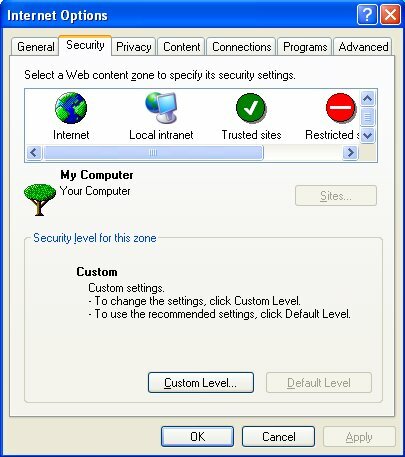 I would never add any site to the 'Trusted Sites' zone. Any site can be hacked, even Windows Update. Or, they may have great programmers, but what if they mess up their shiny new ActiveX control while they're in your Trusted Zone? You're a statisc...stastici...history. There will be more or less options than I've listed here; use your God-given intelligence. -- img alt="Restricted permissions for Internet Explorer" src="drop-my-rights.msi.jpg"
2.) Run the scesp4i.exe file and extract all files to a temporary directory. 3.) Right-click on the setup.inf file and choose the install option. 4.) Answer no if asked to overwrite essent.dll.